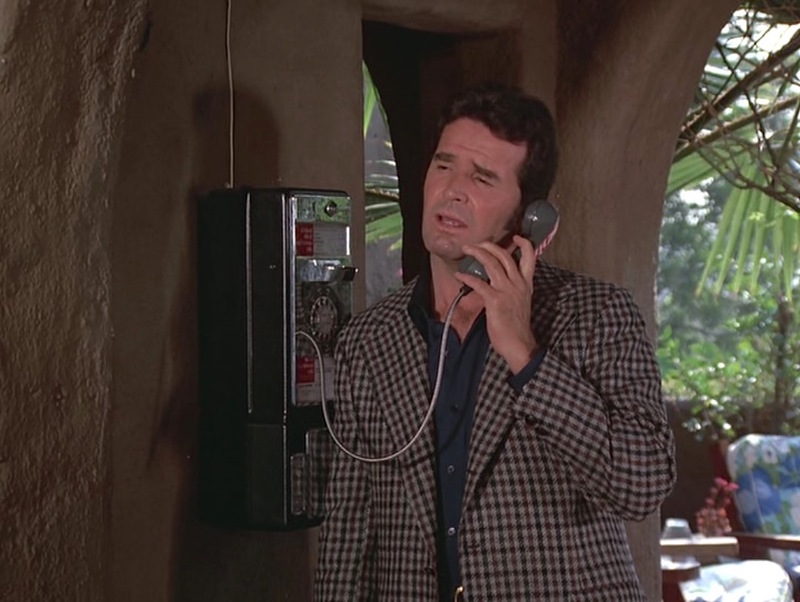 Each episode of The Rockford Files began with a message left on Rockford’s answering machine, typically a humorous non-sequitur illustrating his world of bounced checks, missed payments, gilted dates, and persistent sales reps before launching into the show’s iconic opening credit sequence, scored by a distinctive and memorable theme song composed by Mike Post and Pete Carpenter. Following the credits, audiences were treated to an hour in Rockford’s world as the ex-convict private eye sped around the greater L.A. area in his latest Pontiac Firebird Esprit, doing his best to earn his usual rate of $200 a day plus expenses…not that he typically received this payment from his clients. The pilot episode, a movie-length episode retitled “Backlash of the Hunter” for syndication, established much about the show and character that would last the duration of the series, including his beachside mobile home (though the address and location would change), his circle of unreliable clients, colorful confidants, and distrustful police officers, his unfortunate financial situation, his relationship with his retired trucker father “Rocky”, and his preference for talking his way out of trouble rather than fighting. 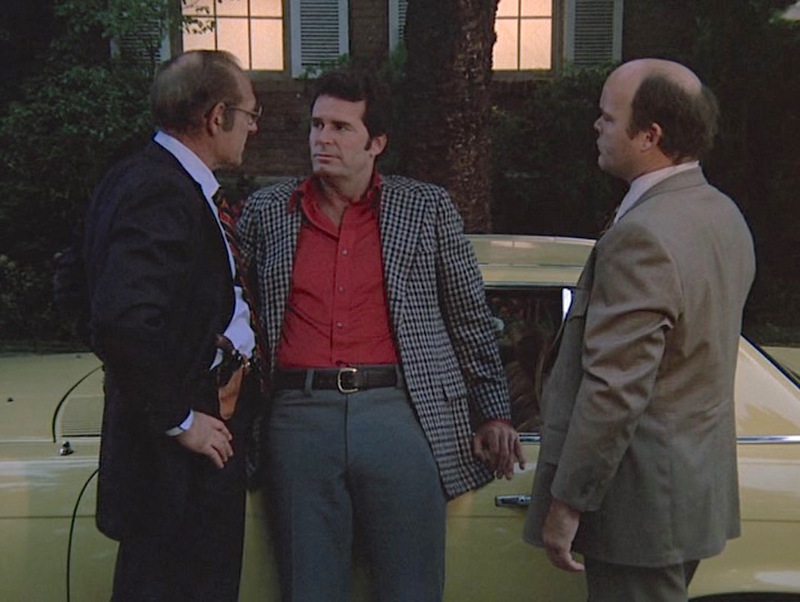 Perhaps in the spirit of classic noir detectives, Jim Rockford’s wardrobe was famously off-the-rack, inexpensive duds that represented ’70s streetwear at its best with a rotation of sport jackets (often plaids, checks, and tweeds), large-collared shirts worn open at the neck, gabardine slacks, and loafers. 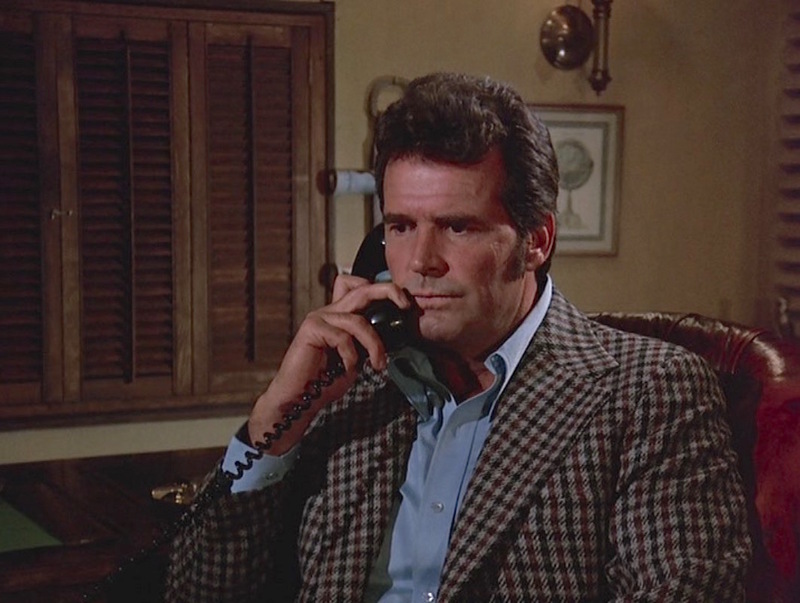 For the first of several posts to come celebrating and exploring Jim Rockford’s off-the-rack style, we go back to where it all began with the pilot episode, “Backlash of the Hunter”, that aired six months before the first season premiered in September 1974. 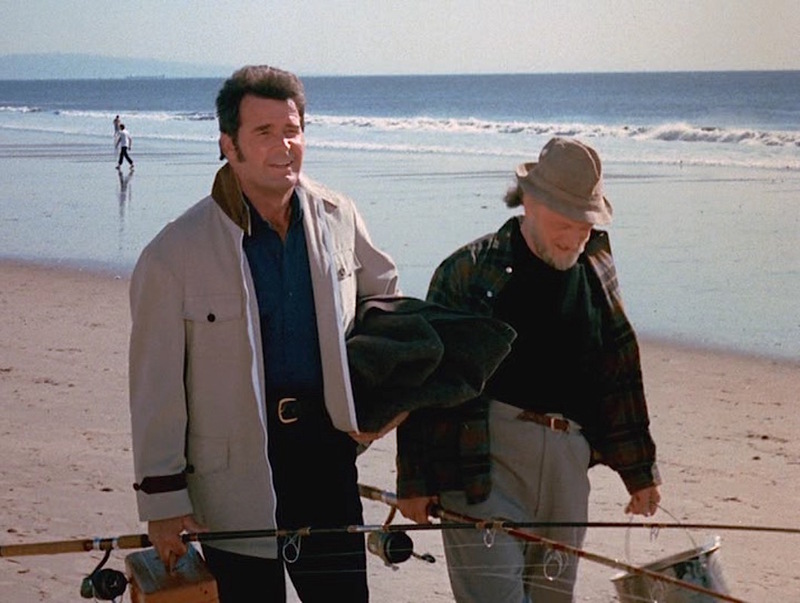 We first meet Jim Rockford walking on the beach with his father Rocky, played here by Robert Donley rather than Noah Beery Jr., who would make the role memorable over the next six seasons. Jim has to disappoint Rocky by changing their plans to go fishing as he has a potential client, Sara Butler (Lindsay Wagner), waiting for him at his mobile home/office. Jim is still dressed for fishing when he meets Sara, sporting a sporty beige waxed cotton jacket. While the same length as a sports coat, the jacket has a Harrington-style standing two-button collar and a zippered front with white tape that extends from the collar down to the bottom of the jacket that hits the hips. The sleeves can be tightened at the cuffs with one of two brown sew-through buttons through a pointed half-tab in the same chocolate brown suede that matches the underside of the collar. The jacket also has four patch pockets—two plain ones on the chest, two pleated ones on the hips—that all close through a single button on a pointed flap. Though I believe this jacket’s appearances are limited to the pilot, it gets plenty of screen time, book-ending the episode as Jim wears it during both the prologue and the desert-set conclusion. Rocky is so disappointed that Jim can’t go fishing with him that he completely changes his appearance for the rest of the series. Sara hires Jim to find out who killer her wino father two months earlier, and the case begins, setting off a feature-length showcase of car chases, bathroom fights, and the witty repartee that would become The Rockford Files‘ hallmark. After taking her case, Jim changes into a more characteristic sport jacket in a bold gun club check that would become an early-season staple for the detective. As Alan Flusser describes in Dressing the Man, the erstwhile Coigach check from the west of Scotland received its more evocative “gun club” moniker when it was adopted as the livery for an American shooting club around 1874. “Its warp and weft are generally arranged in three colors and woven in two-up, two-down twill. An even check pattern with rows of alternating colors,” in Rockford’s case, these alternating colors are maroon and navy on a gray ground. The single-breasted jacket has substantial notch lapels, fashionable for the mid-1970s without looking as excessive as some disco-era lapels, that roll over the top of the three black woven leather buttons on the front for a classic 3/2-roll, which Jim wears both open and with only the center button fastened. Rockford’s jacket also has a welted breast pocket, set-in hip pockets with wide flaps, a long single vent, and non-functioning two-button cuffs. All in all, a stylish jacket for the era that still manages to avoid the most egregious of the decade’s menswear trends. In smaller scales and larger scales like Rockford wears here, gun club check remains a timeless menswear pattern with modern examples available from purveyors like Spier & MacKay. Rockford checks with his sources to confirm Sara’s identity and the story that she’s pitched him. 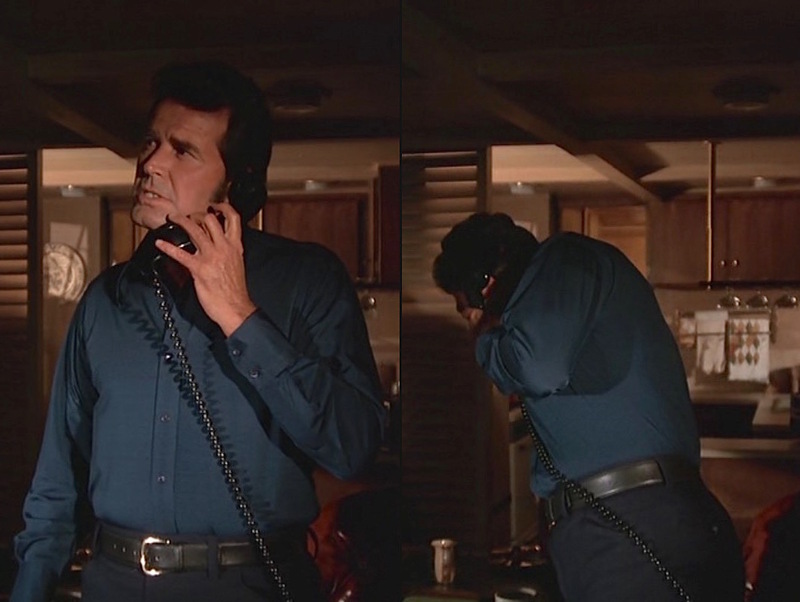 When taking Sara’s case and beginning his investigation with her, Jim wears a navy shirt made from a silky synthetic material, likely rayon as this would have been popular in 1974, with a large point collar, front placket, and two-button barrel cuffs. 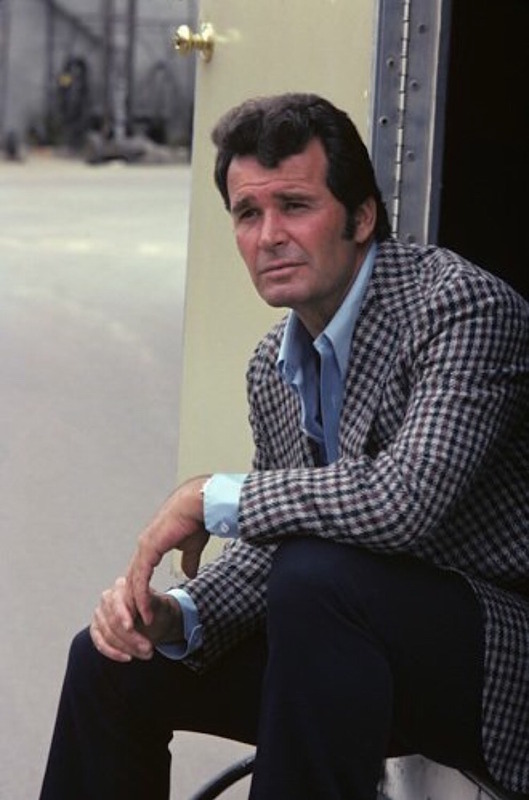 Per Rockford’s laidback style standard, he wears it with no tie and the top few buttons undone at the neck and chest. Rockford takes a drag from his Camel as he listens to Sara Butler’s story. The shirt is tucked into a pair of dark navy flat front trousers with thick belt loops, side pockets, jetted back pockets with a single button each, and plain-hemmed bottoms. He wears a thick belt in plain black leather with a polished gold-toned single-prong buckle. As Sara caught Jim while he was dressed for fishing, he’s still wearing sneakers rather than the loafers that would become his signature. These navy canvas sneakers have thick white rubber outsoles and white laces that, combined with his white socks, make the extremely casual footwear especially jarring when worn with his sports coat and slacks. Jim and Sara’s blonde fellow diner in the periwinkle jacket seems so ashamed of Rockford’s underdressed footwear that she must shield her eyes from them. Later in the episode, Jim is getting a late bite with Sara when he notices they’re being followed. Jim lures the hood—Jerry Grimes (William Smith)—to a bar, where he uses some classic P.I. trickery to knock him out before interrogating him…and mocking his decision to follow him in a bright red Cadillac convertible. Jim continues to ruin Jerry’s night, first by getting Sara to hit on Jerry at the bar and then slip him some knock-out drops back at his hotel so she and Jim can search his room. The adventure—and the truth about Rockford’s five-year stint in prison—leads to Jim and Sara hooking up, then heading to Vegas to bring the case to a conclusion. For this final act of the episode, Jim again wears the gun club check jacket but over a sky blue shirt similarly styled to the navy shirt with its long point collar, front placket, and two-button cuffs. 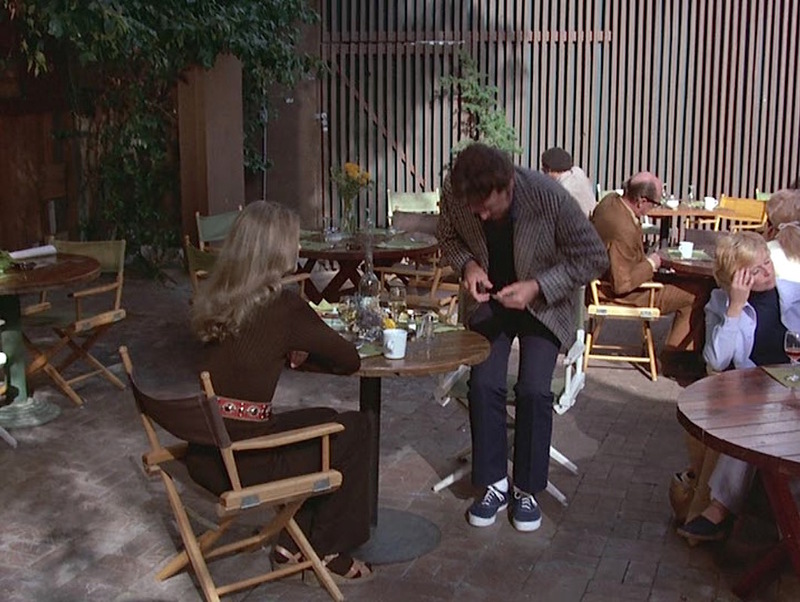 If the navy sneakers were particularly informal for Jim Rockford’s style, the cordovan leather lace-up ankle boots are a touch more formal than we’re used to seeing in later episodes. 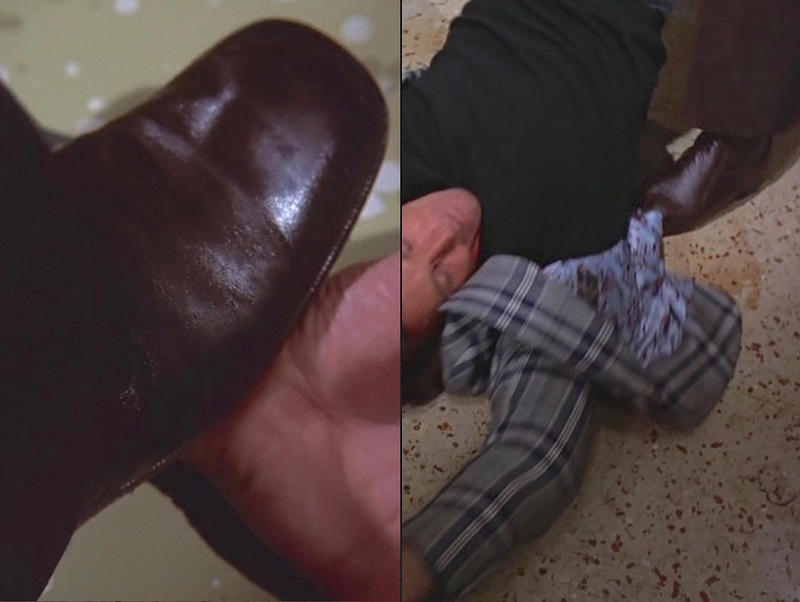 There appears to be some issues of continuity during the bathroom fight sequence as James Garner looks to be wearing a pair of Chelsea boots during some of the action while other shots while he’s restraining Jerry clearly show a pair of plain-toe oxfords. 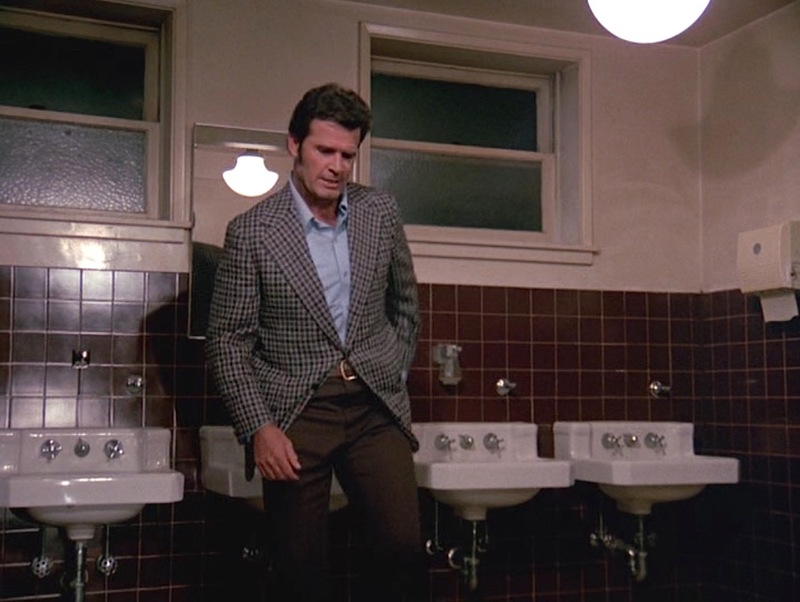 The outfit as a whole serves as a fitting template for what would be a quintessential Jim Rockford look, though he would soon branch out into more individualistic touches such as his black, brown, and tan loafers with bar-chain horsebit detailing and colorful, striped belts. 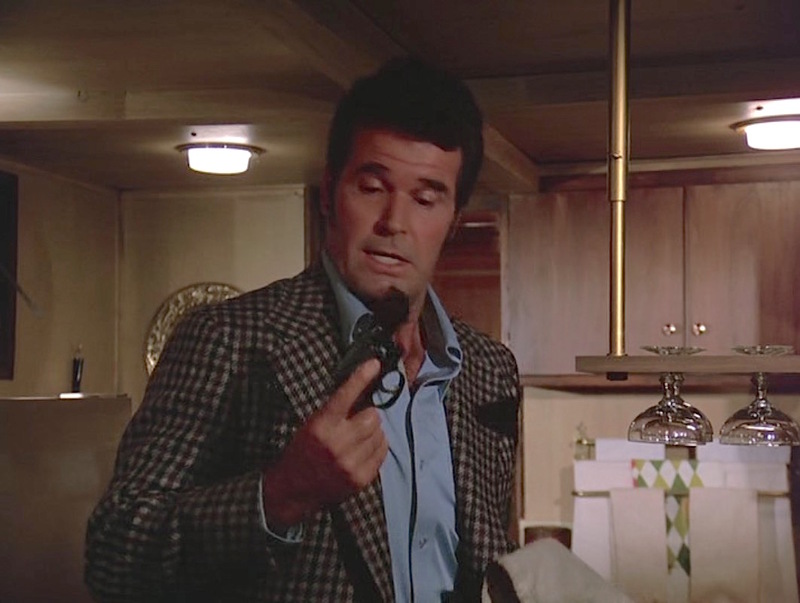 One constant from this outfit and the rest of Rockford’s ensembles is his watch. James Garner first picked up his steel Heuer Carrera 3647N racing watch in the mid-1960s, around the time he made the motorsport epic Grand Prix (1966), and it’s fitting that this durable, racing-oriented watch would dress the wrist of Jim Rockford, a character whose Pontiac Firebird—and his signature “J-turn” maneuver in it—became almost as iconic as the character himself. The Heuer Carrera was also a trusted timepiece of Mario Andretti, whose gold 1967 Carrera Pilot 1158CH is featured in Matt Hranek’s A Man and his Watch alongside a steel Heuer Autavia that the racing legend was gifted by Motor Age magazine following the 1967 Indianapolis 500. You can read more about Garner’s watch in this marvelous 2017 article at Calibre 11 with exclusive photos that reveal the actual words “JAMES GARNER” inscribed on the two-register black dial. After being worn for a substantial amount of the pilot episode and several promotional photos, the jacket makes its next appearance in “Exit Prentiss Carr” (Episode 1.04), the episode that introduces us to the Raymond Chandler-esque town of Bay City, California, where Rockford is far from welcome. Jim spends a day in Bay City investigating the death of the titular Mr. Carr while wearing this jacket over a bright scarlet shirt that follows its blue predecessors from the pilot with its silky rayon-like cloth, long point collar worn open at the neck, front placket with self-colored buttons, and two-button barrel cuffs. His flat front trousers are now a shark gray with frogmouth front pockets and button-through jetted back pockets and are worn with the same black belt that we saw in the pilot episode, here coordinated to match his black leather drivers with their gold bar-chain horsebit detail. Rockford borrowed his client’s butter yellow Mercedes-Benz for an investigation in Bay City, but it wasn’t enough to hide him from the two Bay City cops out to get him. 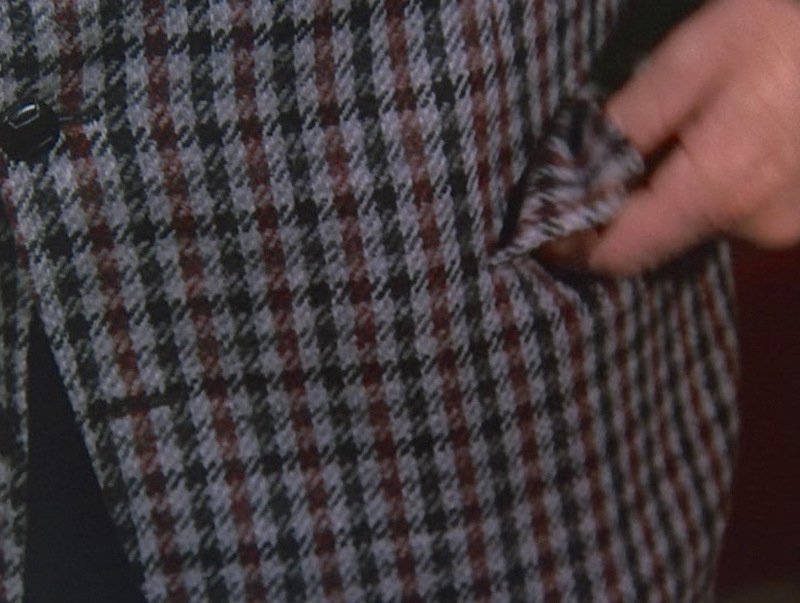 Unlike the pilot episode when Jim’s blue and brown underpinnings were independent of the jacket, “Exit Prentiss Carr” shows Rockford coordinating the colors of his sports coat to the clothes he wears with them; the bold red shirt draws out the jacket’s maroon check, the black belt and shoes pull out the black check in the jacket, and the gray trousers harmonize with the slightly lighter gray ground in his jacket. 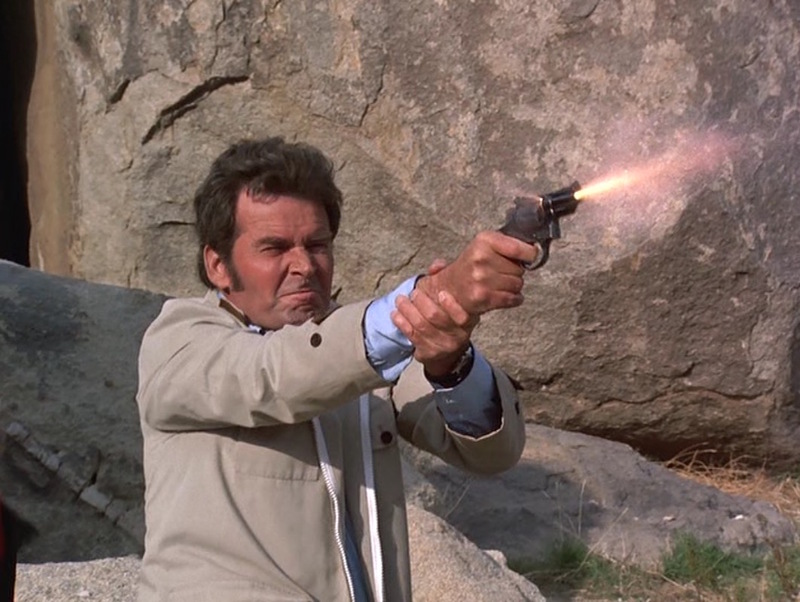 Part of Jim Rockford’s appeal is his diversion from the prototypical TV hero or fictional detective. He’s a moderate drinker (mostly in social situations), he prefers to talk his way out of situations rather than using his fists, and he’s very hesitant to carry a gun, mostly because the piece he does have he doesn’t have a license to carry though he does tell a client in “Tall Woman in Red Wagon” (Episode 1.05) that he’s “scared to death of ’em.” There are rare situations—such as the finale of the pilot episode—where Rockford finds the need to arm himself, however, and in those situations, he turns to his cookie jar. In “Backlash of the Hunter”, Sara is in Rockford’s mobile home when he spies him unwrapping something retrieved from said jar. “What’s that?” she asks. “It’s my gat,” responds Rockford, flashing a Smith & Wesson Model 19 revolver with a 2.5″ barrel before sticking it in his belt and explaining that he doesn’t have a permit to carry it despite his detective’s license. Rockford checks out his “gat”, properly keeping his finger off the trigger. Having served in the U.S. Army during the Korean War, James Garner no doubt would have been familiar and comfortable handling firearms properly and safely. The weapon was introduced as the Smith & Wesson .357 Combat Magnum in late 1955, developed for the police market as a K-frame alternative so that officers could efficiently and effectively carry .357 Magnum revolvers without dealing with the heft and bulk of the N-frame original. When Smith & Wesson began numbering its models in 1957, the N-frame became the “Model 27” while the K-frame was designated the “Model 19”. In 1966, the 2.5″ barrel became standard with the Smith & Wesson Model 19-2 variant. Two decades before John McClane would down a helicopter with two shots from a .38 in Die Hard with a Vengeance, Jim Rockford beat him to it, blasting away with his S&W Model 19 from a rocky cover in the desert and finally bringing an end to Jerry Grimes’ criminal career…and life. Jim’s fishing jacket returns for a the climactic action scene in the desert. By the second season, Jim’s sidearm would be established as a third-generation Colt Detective Special, a cosmetically similar blue steel snub-nosed revolver with a shrouded ejector rod, though the Detective Special was primarily chambered for .38 Special rather than the longer and more powerful .357 Magnum cartridge of the Smith & Wesson Model 19. Rockford’s aversion to physical fighting means he often takes shortcuts—or as some would call it, fighting dirty—to get the upper hand on his opponents, particularly ones that he’s gotten tired of having follow him over the course of a case. In “Backlash of the Hunter”, the target of Rockford’s trickery is Jerry Grimes. Grimes, a martial arts expert played by the physically imposing William Smith, would likely have an advantage over Rockford, so the private eye prepares himself for battle by heading into a bar bathroom where he would appear to be cornered. Once there, Rockford spills some liquid hand soap over the floor between him and the door. He then backs into a corner and reaches into his pocket for a roll of dimes to give his inevitable punch some extra power. 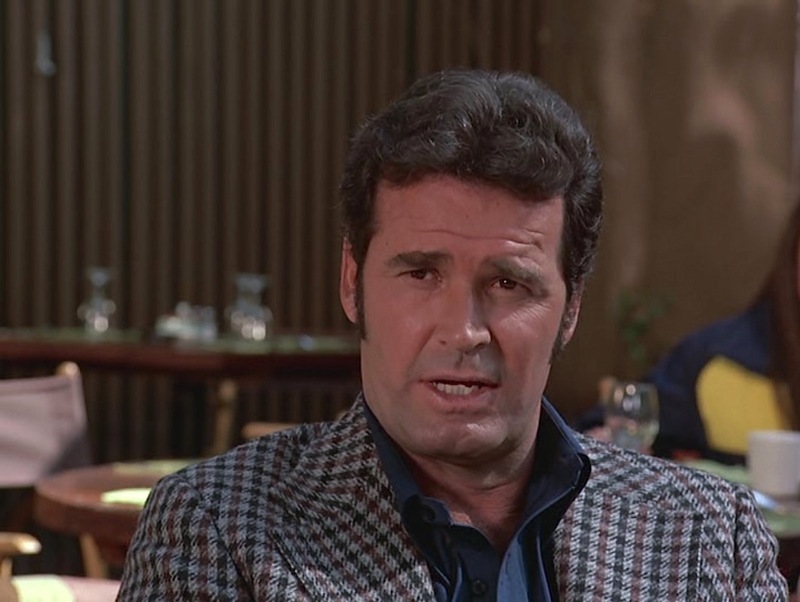 Note that this has been corrected from a shot that was reversed to make it appear that Rockford was pulling his coins from his right-hand pocket when—as you can see in this corrected shot—it was actually his left-hand pocket. You gotta be one of the dumbest lookin’ apes I ever saw. ‘course, you big, muscle-bound guys, you’re usually compensating for feelings of inadequacy. 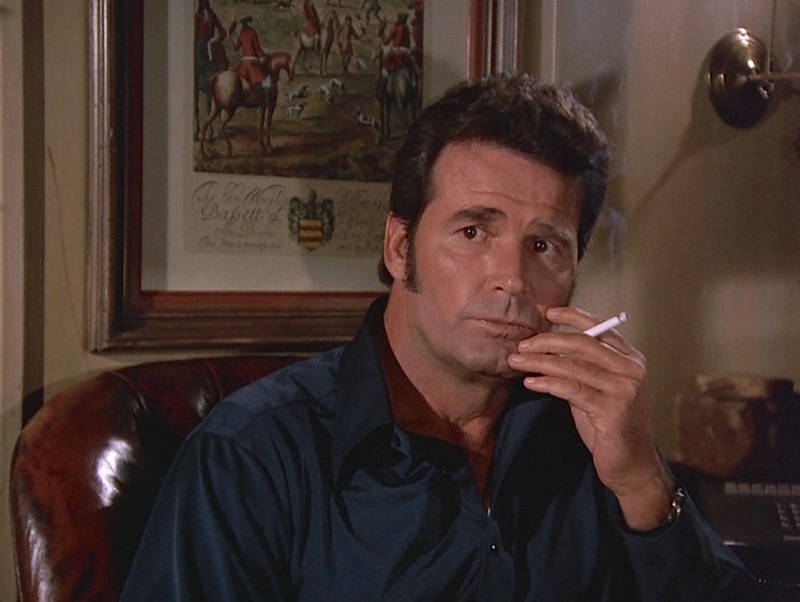 Unable to stomach the continued attacks on his pride, Jerry lunges for Rockford, who hits him back with a fistful of dimes. 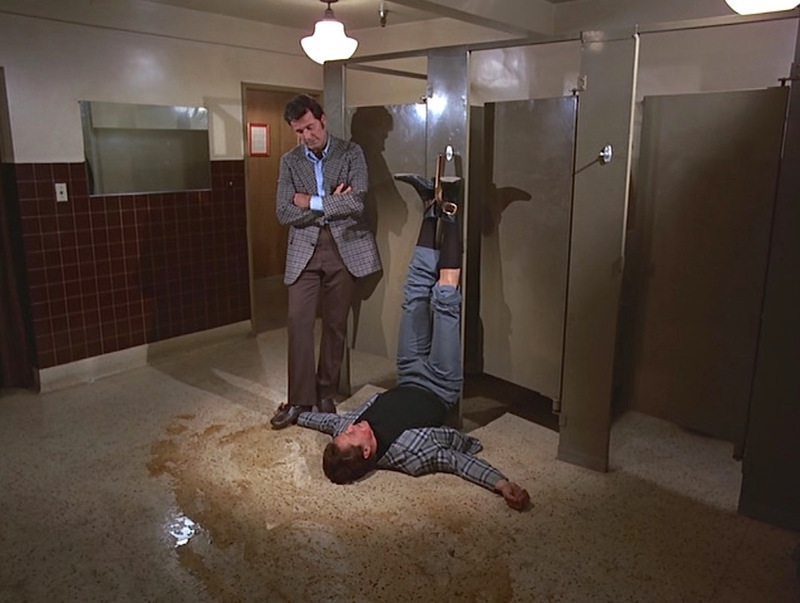 Jerry, unable to gain traction on the soap-covered floor, slips onto his back, where Rockford is able to knock him unconscious and subdue him by using his own belt to secure his legs to the hook outside a bathroom stall. The trouble with karate, Jerry, is it’s based on a ridiculous assumption that the other guy’ll fight fair. As with most eras, an overly fashionable dresser in the 1970s could risk looking dated in the decades to follow. 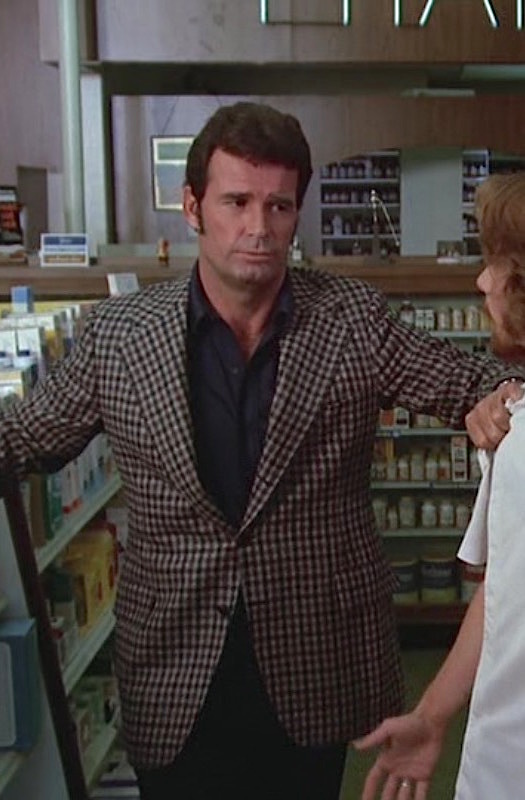 Luckily for Jim Rockford, his no-nonsense approach to dressing incorporates trendy sensibilities onto a timeless foundation. Jim’s lapels and collars may be a touch wide, but—ultimately—his chosen “uniform” of a checked single-breasted sports coat, open-collar dress shirt, flat front slacks, and casual shoes transcend trends to work in any period. 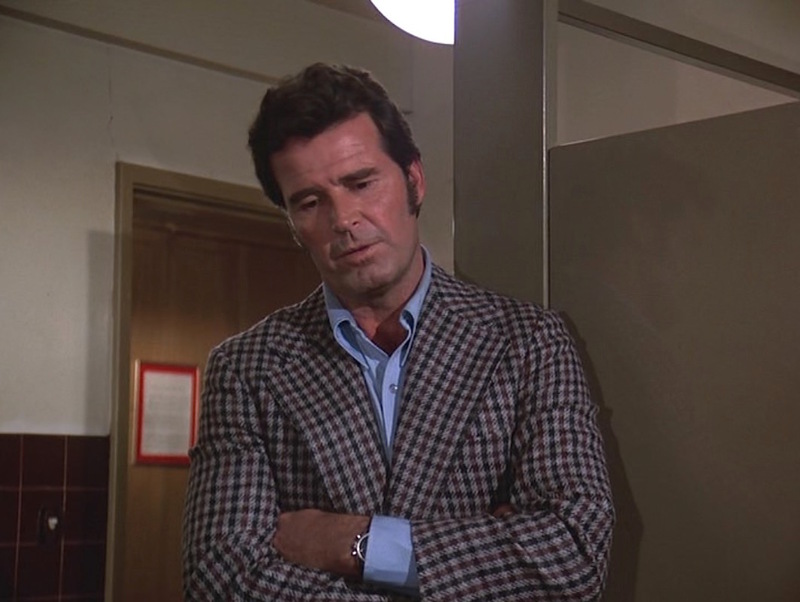 The pilot episode also introduces a few other odd jackets that would be Rockford staples across the first season, including a light brown herringbone tweed 3/2-roll jacket and a dark gray flannel blazer with three shining metal buttons. Well, I think it makes me an unprincipled jerk. Since I don’t have any real close friends, I have to get along with myself so I don’t take cases where I don’t think I’m wasting my time or your money. One of my favourite actors and one of my favourite characters – thank you for this article! This is a timely entry because the show has recently found its way on to YouTube. You did a wonderful and accurate job summing up his style – thanks!